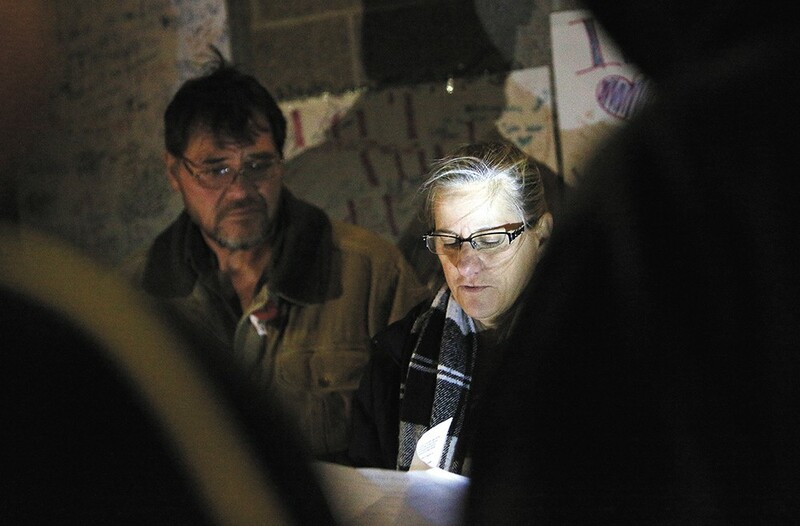 Donna Fagan, pictured in front of her husband, City Councilman Mike Fagan, organized a candlelight vigil on Sunday to pray for those who are lost to their circumstances. Scotty Keller barely knew the two people killed before his eyes the morning of Oct. 8. That morning, at dawn, Keller snuck away from the couch he was crashing on in search of a cigarette. In the Safeway parking lot in Hillyard, he found Sheera Cunningham, 41, who he'd met on the streets briefly once or twice before. She had a small dog, a Maltese named Annabelle. It was cold outside, so Cunningham offered Keller, 27, her blanket, and they huddled up together against a corner of the building. After a couple of minutes, Keller says, a man called "Doughboy" joined them under the blanket with meth and a pipe to smoke it — Keller would later learn Doughboy's real name was Julius Bradley Cooper. He was 38. Scotty Keller, 27, in Sacred Heart Medical Center. Then, everything seemed to happen at once. They heard the roar of a car engine, and a screeching sound as it scraped the building. The next thing he knew, Keller was looking at Cooper and Cunningham lying unconscious a few feet in front of him. Annabelle barked and nipped at Keller's ankles as he stumbled into Safeway looking for help, trying not to pay attention to his cracked hip and broken hand. Through blurry eyes, Keller realized someone was asking if him if he was OK. It happened to be an off-duty firefighter, who called 911 and rushed to provide emergency aid until paramedics arrived. Someone brought Keller a chair as he faded in and out of consciousness. "It seemed like I was gonna die," Keller tells the Inlander. A tear falls down his cheek as he remembers the two who did. Cooper, by all accounts a quiet, kindhearted man hardened by the streets and the death of his younger brother, was pronounced dead the day of the crash. Cunningham, an eccentric artist and mother of three, died in the hospital several days later. Spokane police are still investigating what led to the crash. Brittney Moen, the 24-year-old driver of the silver Toyota Celica that allegedly ran into them, went to jail on charges of vehicular homicide and vehicular assault. Drug paraphernalia was found inside her car, though police found no immediate signs that she was impaired, according to court documents. For the victims, the days, months and years leading up to the crash reveal the tragic circumstances that brought the three victims together on the streets for one fateful moment. It provides a glimpse into the way homelessness and drug addiction intersect, stripping people of their identity and sometimes putting them in danger. It's why, two weeks after the crash, family members of the victims gathered at a candlelight vigil at the crash site to remember Cunningham and Cooper for who they were as people — not for their circumstances. "Homelessness and addiction is what drew these people here," says Tammy Scholz, Cunningham's mother-in-law, to more than a dozen people. "And I know we have to find a way to stop it." Damian Cunningham never said goodbye to his wife, Sheera, in person. Sheera Cunningham succumbed to her injuries on Oct. 12. He was in jail when he heard she was in a crash. He spoke on the phone to Sheera while she was in the hospital, before she was no longer able to speak. "She said she missed me and she loved me," he says, clutching Annabelle in his arms days after Sheera died. Damian's best friend introduced him to Sheera 13 years ago. Within two years, they were married. Cara Cunningham, Damian's sister, remembers his excitement when they started dating. "Damian gave me a call just to say, 'Cara, I met this woman and I am so in love,'" she says. "I'll never forget his phone call, the joy in his voice." Born in Hillsboro, Oregon, Sheera had a creative, artistic, bubbly personality to go along with a contagious laugh, Cara says. She wrote poetry, and she made jewelry, hemp necklaces and purses to sell in local stores around town. In 2008, the Spokesman-Review featured Sheera and her friend Rebecca LaBelle for making art out of discarded items. The article described her as an artist and stay-at-home mom. She loved animals and had multiple cats along with Annabelle. Due to medical issues and disability, she couldn't work. A few years ago, Damian was put out of work after he was hit by a drunk driver and broke both his wrists. They ran into financial distress and couldn't pay rent on their house on the South Hill. They lost it in July 2016, Damian says. The kids stayed with friends or relatives. The cats found other owners. Damian and Sheera tried to get back on their feet. But Damian, without a home, couldn't find a job. They both lost their IDs when Sheera's purse was stolen. That made it difficult to find a shelter that didn't require identification and wasn't at capacity, Damian says. So this summer, they stayed out on the streets. Even then, Damian says, she was intent on helping others. If she saw that someone else needed fruit more than her, she wouldn't hesitate to give them hers. If someone was cold, she offered her blanket. Damian was in jail on theft and other charges, but he and Sheera had just agreed to get clean. Sheera had an appointment at a rehab clinic scheduled Monday, Oct. 9. "We talked about how we wanted our old lives back and to get off the drugs and streets," Damian says. Linda Person set up a collage for her son on the coffee table in her apartment in northeast Spokane. His name was Julius, but friends called him Brad. On the street, he was Doughboy. But for Person, the pictures of him taking a bath as a baby, or smiling with various members of his family, represent who he really was. Julius Bradley Cooper was pronounced dead on Oct. 8. "He cared about people, irregardless of what he was doing," Person says. Cooper was born in 1979 in Alaska. 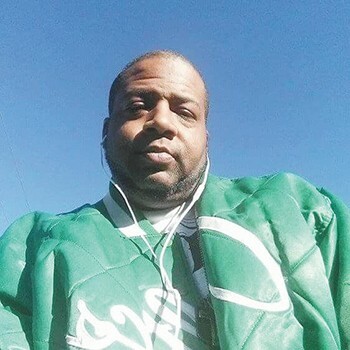 He liked ninja turtles, the Transformers movies, the Washington Redskins and listening to music on his headphones — the headphones were always on. As a kid, he moved to Maryland, where he spent most of his life. He moved to Spokane eight years ago, where his mother and his family lived. In the early morning hours of May 1, 2014, his youngest brother, Trevor Hallman-Person, was killed in a car accident on I-90, east of Ritzville. He was just 19. Cooper was devastated. "I'm so numb full of hurt and rage in my heart," Cooper wrote on Facebook that day. He spiraled downward. He became homeless. He started using more drugs. In 2016, he was caught shoplifting. Months later, he was caught with meth on him. Person says it was hard to get help for her son, since he wasn't the type of person to seek it. "Not everybody is willing to walk up to a place and say, 'I need help, I have an addiction, I have a problem and I can't stop,'" Person says. Brandon Joy, who years ago lived in the same apartment complex as Cooper, came across Cooper, down on his luck, a few times in the weeks before the crash that took his life. He'd see him walking, slowly, along the road. He'd offer a ride, and Cooper would struggle to get his legs in and out of the car — Cooper suffered from gout. Still, Joy says Cooper was always smiling. "Even when he was getting out of the car, he still cracked a joke," Joy says. "He doesn't let you get in a bad mood." The last time Joy saw Cooper was Friday, Oct. 6, two days before he died. Later that Friday night, Joy went over to his friend's house. Coincidentally, he says, a woman was there whom Joy had never met before: Brittney Moen, the driver who would be charged in the fatal crash. Joy doesn't think the two knew each other at all. It was the first time she'd been there visiting his friend in years. But whatever was going on, Joy can imagine what Cooper was doing in the moments before Moen's car crashed into him. "I guarantee he had his headphones on," Joy says, "and he was making people laugh." Sitting in her wheelchair, Jeannie Keller watches her grandson, Scotty Keller, writhe in pain from his Providence Sacred Heart Hospital bed. 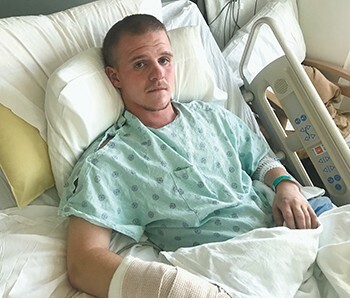 Nine days after the crash, a physical therapist discusses Scotty's next step: He'll move to respite care at Catholic Charities' shelter, House of Charity. In February 2016, the family was kicked out of their house when the landlord couldn't make the mortgage payments. Everyone — Scotty's mom, Carey Farnworth, and Scotty's uncle and sister — all went their own way without a permanent place to sleep. Jeannie slept in cars. Scotty couch-surfed or slept on the streets. In August of this year, Scotty's mom, Carey Farnworth, died at 45 from a blood clot. She was found in Cannon Park. Scotty is convinced that if she hadn't been homeless, she'd still be alive. It's eaten at him ever since. And like so many others on the streets, he used drugs to help cope. "It's me trying not to think about my mom," he says. "Because that's pretty much all I do." It's why he was there the morning of Oct. 8. Now, every day, he thinks of the two others he met on that day, and of the people he hardly knew. He tells his grandma he doesn't want to go back to the streets.